Why use CLEAN to teach about climate and energy? The Climate Literacy and Energy Awareness Network (CLEAN) collection is a peer-reviewed source of over 700 high-quality and NGSS-aligned climate and energy educational resources for grades K-16. The NGSS three-dimensional instructional model challenges science educators to rethink our lesson and unit planning process by the inclusion of Disciplinary Core Ideas (DCIs), Science and Engineering Practices (SEPs), and Crosscutting Concepts (CCCs), as they bundle Performance Expectations (PEs). 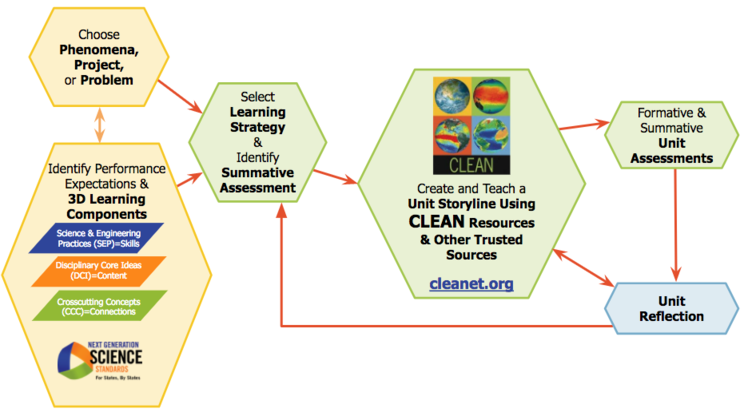 How can CLEAN be used to create three-dimensional learning units? Identify your grade level and curriculum learning objectives. Choose the PE (standard), or bundle of PEs (standards) that address the learning objectives. Develop a phenomenon-based unit storyline by identifying the DCIs (content), SEPs (skills), and CCCs (connections) that "unpack" the selected PE(s) or standard(s). Select CLEAN educational resources for lesson activities that build students' understanding of the standards-aligned phenomenon. How do I develop climate and energy lessons and units using CLEAN and NGSS? Use the Unit Planning Template or the Lesson Planning Template for step-by-step guidance to create new, or revise existing, lessons and units. The Get Started Guide provides more details on creating NGSS-aligned lessons using CLEAN resources and is available to download.